Orbital ATK launched a Cygnus spacecraft Tuesday as part of the company’s seventh operational cargo resupply mission to the International Space Station under NASA‘s Commercial Resupply Services-1 contract. The company said Tuesday the spacecraft, nicknamed S.S. John Glenn, lifted off at 11:11 a.m. Eastern time from Cape Canaveral, Florida, aboard a United Launch Alliance-built Atlas V rocket on a mission to deliver 7,600 pounds of food, clothing, crew supplies, spare parts, laboratory equipment, scientific experiments for the ISS crew. NASA said Wednesday that the cargo will aid new and existing scientific investigations that include studies on cancer-fighting drugs, crystal growth and atmospheric reentry. The ADCs in Microgravity experiment will test Oncolinx‘s antibody-drug conjugates in microgravity to support ongoing efforts to increase the effectiveness and reduce the side effects of chemotherapy. S.S. John Glenn will also conduct three secondary OA-7 missions after the spacecraft leaves the space station, including the initiation of the Saffire-III payload experiment designed to study the behavior of fire in microgravity as well as the deployment of four cubesats intended for weather monitoring and ship tracking. 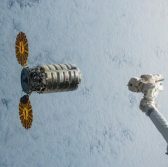 Other investigations to be supported by the latest Cygnus mission include the CLYC Crystal Growth experiment, which aims to discover the conditions for the development of defect-free crystals, and the Thermal Protection Material Flight Test and Reentry Data Collection investigation. Orbital ATK is scheduled to launch two more CRS missions for NASA later this year using the company-built Antares rocket. The company will also perform at least six cargo missions beginning in 2019 under its CRS-2 contract with the space agency.